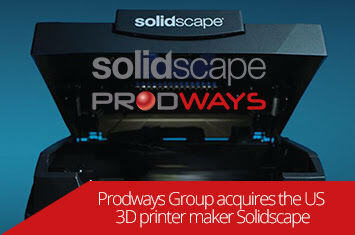 Prodways Buys Solidscape from Stratasys: What’s It All Mean? The landscape of the 3D printing industry is starting to shift, as Prodways, a French manufacturer of industrial 3D printing systems, has announced its acquisition of Solidscape, a Stratasys subsidiary dedicated to a unique wax 3D printing technology. The news has implications for both Prodways and Stratasys. Prodways is quickly expanding its technology portfolio, having begun with its flagship MOVINGLight digital light processing (DLP) technology and growing to include laser sintering for plastics and Rapid Additive Forging for large-scale metal parts. The company’s portfolio will now include Solidscape’s wax 3D printing technology, which is capable of producing wax master patterns with very fine details for investment casting. This makes it ideal for 3D printing small components for the electronics, biomedical, dental, medical and jewelry industries. Prodways is in the process of fulfilling the mission of Raphaël Gorgé, chairman and CEO of Prodways Group, who has said that he wants the company to be the third leading integrated industrial 3D printing company. With systems, materials and software, Prodways is well on its way to achieving that goal. This is particularly true since Stratasys, one of the two leading integrated 3D printing companies aside from 3D Systems, is shedding some of its own holdings. In addition to Solidscape, the company has spun out two of its R&D groups into their own companies: Evolve Additive and Vulcan Labs. Interestingly, Stratasys maintains investments in these companies and has continued to invest in other firms. The company has also seen its leadership change frequently in recent years, including the replacement of CEO Ilan Levin by interim CEO and Chairman of the Board Elchanan Jaglom in March 2018. “Since 2011, Stratasys proudly promoted Solidscape and its proprietary technology as part of its product portfolio. As Stratasys moves strategically to more focus on specific vertical markets, we believe that this acquisition is beneficial for all parties and we wish Prodways the best of luck in accelerating the growth of Solidscape and maintaining its position as a market leader in its core markets,” said Rich Garrity, president of Stratasys Americas. Solidscape also complements Prodways MOVINGLight technology, which is used in the jewelry industry. Together, the technologies will allow Prodways to have a more comprehensive offering in this market. The company believes that, over the course of a year, Solidscape will generate $10 million in 2019, including 50 percent from materials and supplies sales. With Solidscape’s 66-person headquarters in New Hampshire, the company will also expand Prodways’ presence in the United States and North America. The amount of the transaction was not disclosed, but the purchase will be paid for in cash.